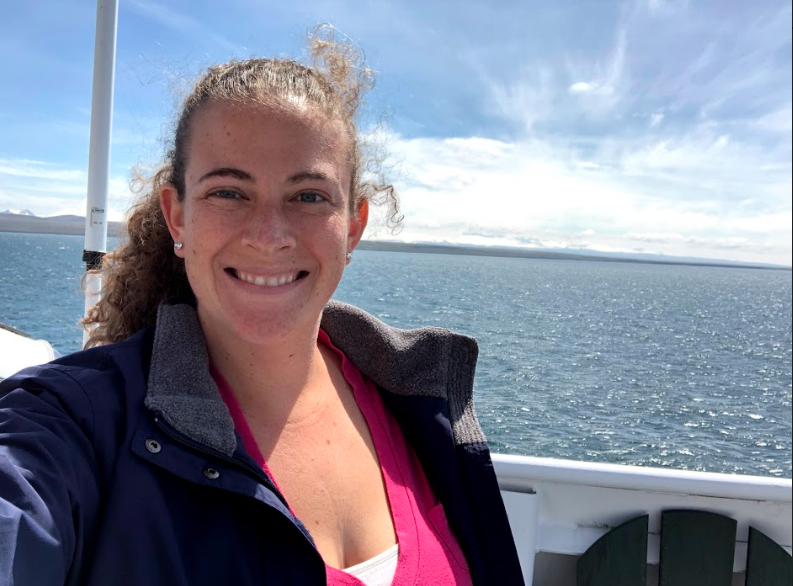 TAS Lacee Sherman wearing her NOAA Ship Oscar Dyson hoodie while visiting the ocean only 4 days after returning home. Wow! What an incredible experience! When I was first accepted into this program I knew that it would be great and I knew that I was going to be working on research, but I feel like I ended up getting way more than I had expected. While filling out my application for the NOAA Teacher at Sea program we were given the opportunity indicate a preference for locations and types of research. I indicated that I would have been happy with any of them, but I was honestly hoping to be on a fisheries cruise, and my first choice of location was Alaska. That’s exactly what I got! I could not have picked a more perfect match for myself. 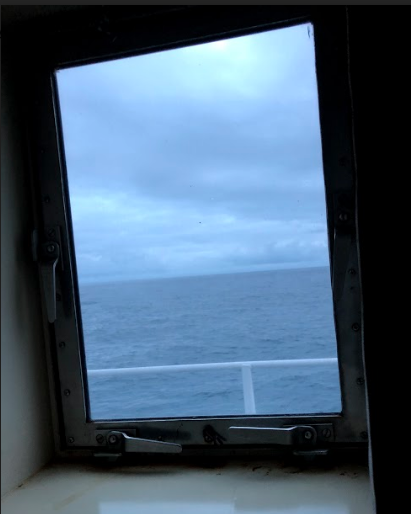 When I first received my specific cruise offer to join NOAA Ship Oscar Dyson it was pointed out to me that 23 days at sea was a LONG cruise, and I was a little bit worried about being at sea for that long when I had never even slept on a ship like that before. What I didn’t realize, was that the hardest part of this research cruise, would be leaving at the end of it. Saying goodbye to the scientists and friends that I had worked closely with for the past 3+ weeks was pretty tough. The natural beauty of Alaska, and Unalaska specifically, is breathtaking. I kept saying that I can’t believe that places like that existed in the world and people weren’t tripping over themselves to live there. This is a part of Alaska that very few ever see. 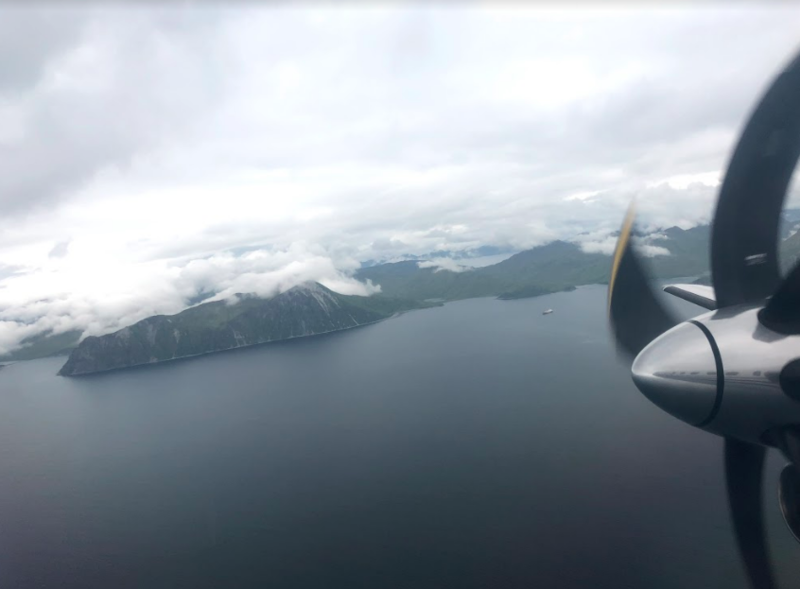 I loved getting to explore Dutch Harbor and see some of the beaches and do a little hiking while in port, and seeing the different islands and volcanoes while at sea. I also was incredibly excited to see all of the wildlife, especially the foxes, eagles, and of course, whales. Video of a whale swimming and then diving in the distance. From the moment that Sarah and Matthew picked me up from the airport, I knew that I was in great company. They immediately took me in and invited me to join the rest of the science team for dinner. Bonding happened quickly and I am so happy that I got to work with and learn each day from Denise, Sarah, Mike, Nate, Darin, Scott, and Matthew every single day. I looked forward to (and now miss) morning coffee chats, and dancing in the fish lab together. I have so many positive memories with each of them, but here are a few: sitting and reviewing and discussing my blogs with Denise, taking photos of a stuffed giraffe with Sarah, go pro fishing (scaring the fish) with Mike, watching Scott identify and solve problems, listening to Darin play the guitar, fishing with Nate on the Bridge, and exploring on land with Matthew. These are just a few of the things that I will remember and cherish about these wonderful people. I know that it happens in all workplaces eventually, but it’s weird to think that the exact same group of people on the ship will never again be in the same place at the same time because of rotations and leave, and whatnot. I feel very grateful that I was on the ship when I was because I really enjoyed getting to know as many people on the ship as possible, and to have them teach me about what they do, and why they do it. Not only did I learn about the Scientific work of the MACE (Midwater Assessment and Conservation Engineering) team, I learned so much about the ship and how it functions from everyone else on the ship. Every single time that I asked someone a question or to explain how something works, I was always given the time for it to be answered in a way that was understandable, and meaningful. 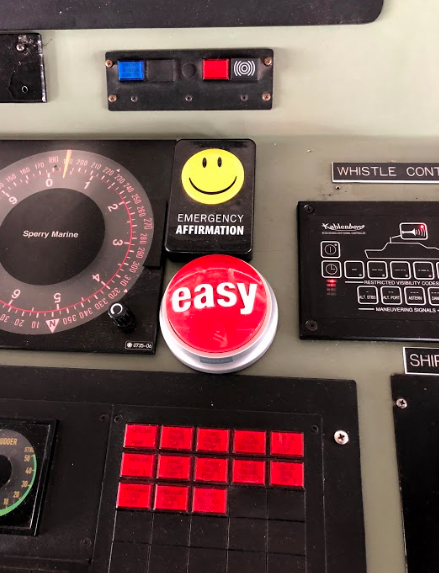 I learned about: charting and navigation (thanks Aras), ship controls (thanks Vanessa), The NOAA Corps (thanks CO and Sony), ship engines and winches (thanks Becca), fancy ship knots (thanks Jay), water data collected by the ship (thanks Phil)… I could go on and on. 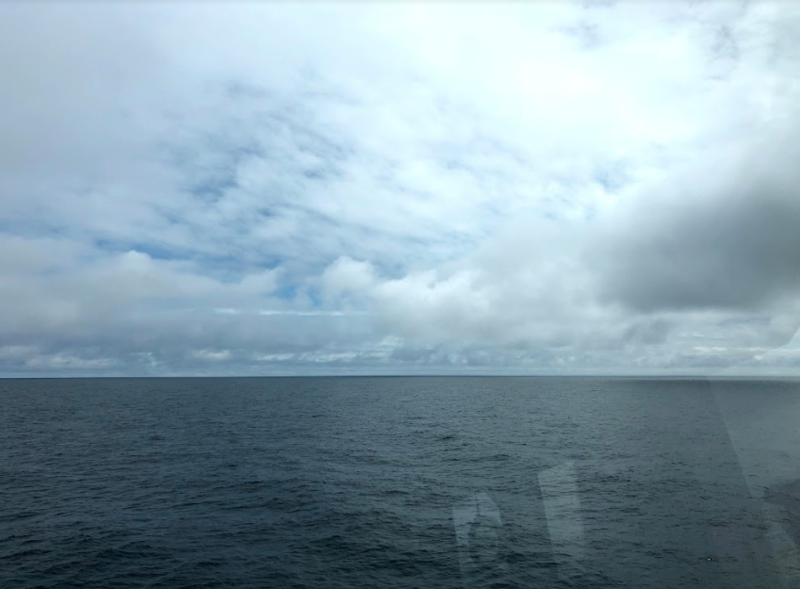 After landing back in port in Dutch Harbor, I got off of NOAA Ship Oscar Dyson and turned and looked at it, and my perception of it had changed completely from the beginning of the cruise. It sounds totally cliché, but it wasn’t just a ship anymore, it was somewhere I had called home for a short time. As I looked at the outside of the ship I could identify the rooms behind each window and memories that I had in that space. It was surreal, and honestly pretty emotional for me. On the last day, once we got into port, my name tag was taken off of my stateroom door and it was replaced with the names of the new teachers heading to sea. It was sad to realize that I really was leaving and heading home. It’s weird to think that the ship will continue on without me being a part of it any longer. 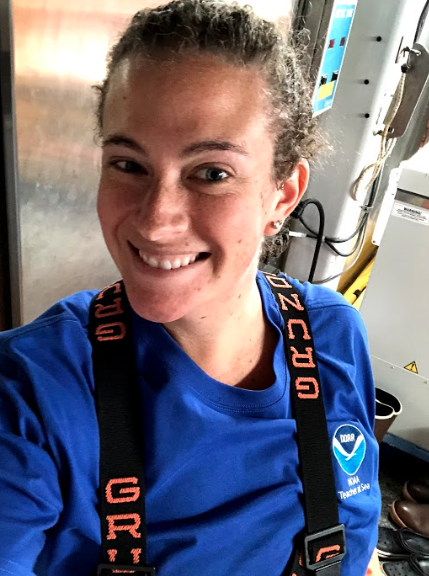 A valuable part of the NOAA Teacher at Sea program was me stepping back from being a teacher, and actually being reminded of what it feel like to be a learner again. 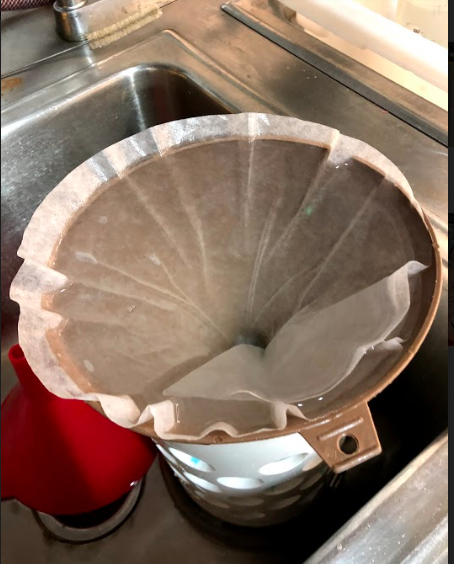 I was reminded of the frustrations of not understanding things immediately, and also the exciting feeling of finally understanding something and then being able to show and explain it. I loved learning through inquiry and asking questions to lead to newer and better questions. These are the things that I am trying to implement more in my classroom. While on the ship I was able to come up with 3 new hands on activities that I will be trying out in my classes this year. This is in addition to the one that is directly related to my research. The new labs that I have created will help me to focus my efforts and give my students the skills that they will benefit from in the future. I am also even more excited to go and pursue my Master’s Degree in the near future than I was before, even though I am more confused on what to go back to school for. I love being able to participate in research in addition to teaching. I really feel like it makes me a better teacher in so many ways. It really reminds me what is important to try and teach my students. In the world of Google searches and immediate information, learning a bunch of facts is not as practical as learning skills like how to test out a question, collect data, and share knowledge learned. I am so grateful for this opportunity and I really hope that I am able to continue to find other research experiences for myself in the future. 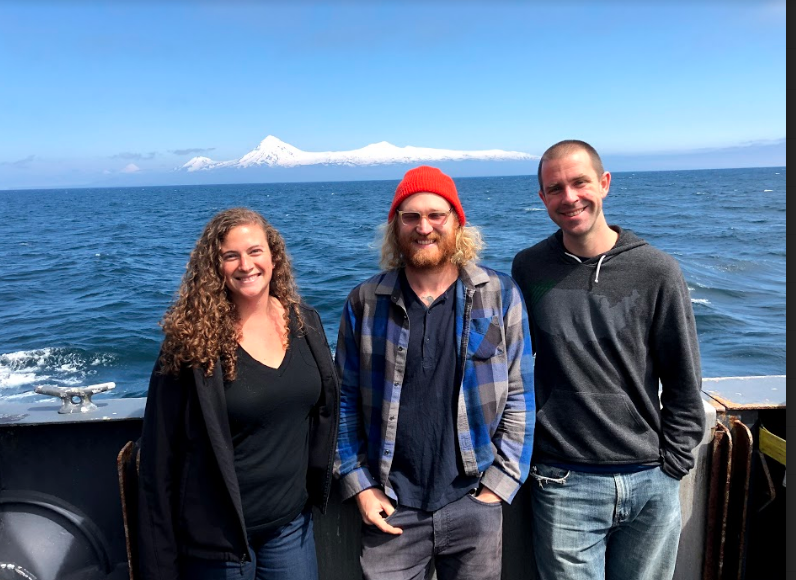 I would love to be able to further my research experiences with MACE by visiting them in Seattle, and I would be happy to hop back on the Oscar Dyson, or another NOAA ship, at any time (hint, hint, wink,wink). Thanks for the memories. 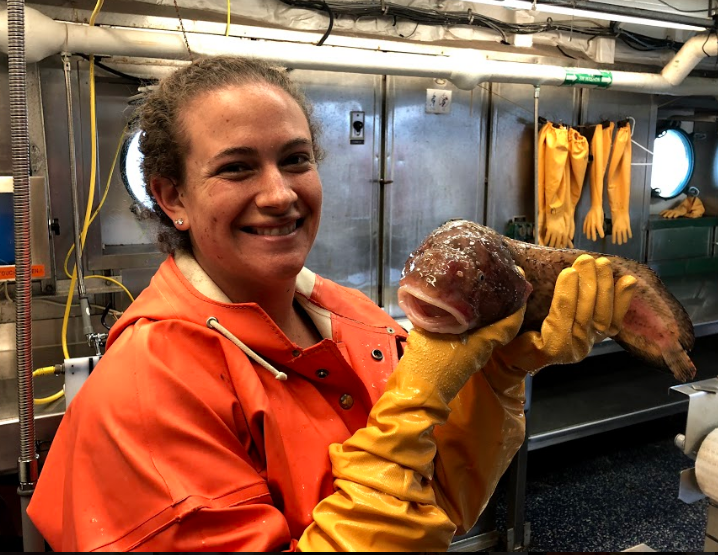 Video of TAS Lacee Sherman on the deck of NOAA Ship Oscar Dyson. With this blog, I will be focusing on the biodiversity in the Eastern Bering Sea. Biodiversity includes all of the different types of plant and animal species in a given environment. All of the species that I will be discussing I’ve seen come up in the trawl net, or have seen from the ship. Ecological Importance: Polllock influence the euphausiid populations and are food to many larger marine species, and humans. Interesting Facts: Walleye pollock produces the largest catch by volume of any single species inhabiting the 200-mile U.S. Exclusive Economic Zone. Identifying Features: 1-2 centimeters in length on average. They look similar to very small shrimp, and often swim in schools. Ecological Importance: Krill are a very important food source for many fish and also larger marine mammals such as whales. Interesting Facts: They are filter feeders and eat zooplankton and phytoplankton, which makes them omnivores. Identifying Features: 16 lines from the center of the bell to the outer edges of the bell. Large range in sizes, from very small to very large. 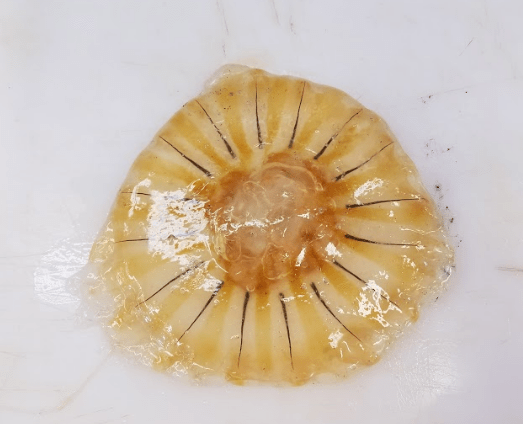 Interesting Facts: Jellyfish may become a problem for the Bering Sea in the future because they reproduce in large numbers and they can dominate an entire environment easily. Interesting Facts: Pacific Ocean Perch are a type of Rockfish. 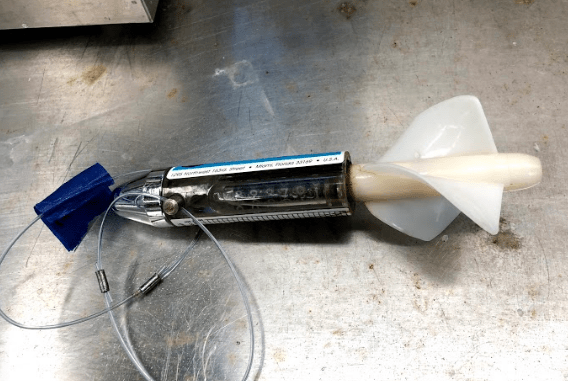 Pacific Ocean Perch have a swim bladder similar to that of pollock, so they reflect similar acoustic signals and can sometimes be acoustically confused for pollock if no sample is taken in a specific area. Ecological Importance: Yellowfin sole are benthic (live and feed on the ocean floor). Interesting Facts: Yellowfin sole grow slowly and may be 10.5 years old by the time they reach 30 cm in length. 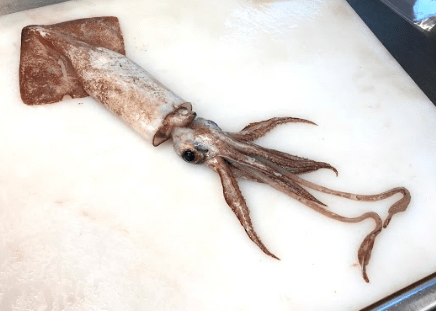 Interesting Facts: These are the most abundant squid found in the waters of Alaska. Ecological Importance: Chum Salmon have adapted to live in saltwater and freshwater. They mainly eat copepods, fishes, squid, mollusks and tunicates. Interesting Facts: Chum salmon eggs are hatched in freshwater rivers and streams. They then travel downstream to live most of their life in the ocean. When it is time, Chum Salmon spawn (reproduce) in the same freshwater stream they hatched in. Once a salmon spawns, they die. Identifying Features: Large scales that are shiny silver along the sides and shiny blue along the top of the fish. Tail has a fork and there is only one dorsal fin. Ecological Importance: Eat phytoplankton and zooplankton. Herring and their eggs are eaten by fish, birds, marine mammals, and humans. Interesting Facts: Herring eggs (roe) are considered a traditional delicacy in Japan called kazunoko. Ecological Importance: Since they are usually found close the ocean floor, they regularly eat things like fish eggs, isopods and amphipods, worms, and small fishes. Interesting Facts: There is another species of Sculpin that is similar called a Red Irish Lord. During our hauls, a member of the science team is needed on the bridge to watch for the presence of marine mammals and endangered bird species. I am one of the people that gets to do this, and I must admit, there is a slight conflict of interest. I, of course, want to see all of the marine mammals possible, but if they are nearby during a haul, we are required to give them space until they pass so that they are not injured in any way by the ship. 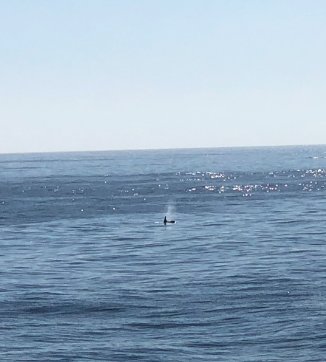 This can definitely slow down the process of hauling if we see them, but of course I don’t mind it if I get to see more whales. Most of the time I don’t see any marine mammals and just end up enjoying a beautiful view of the open ocean. I am definitely feeling more comfortable and at home on the ship now. Constant motion from the swells is the new normal, and the creaks and sounds of the ship are a new soundtrack to listen to (on repeat). Sometimes I like to push the limits and see how far forward or backward I can lean during larger swells to maintain balance and have a few superhero moments as I pretend to defy the laws of physics. 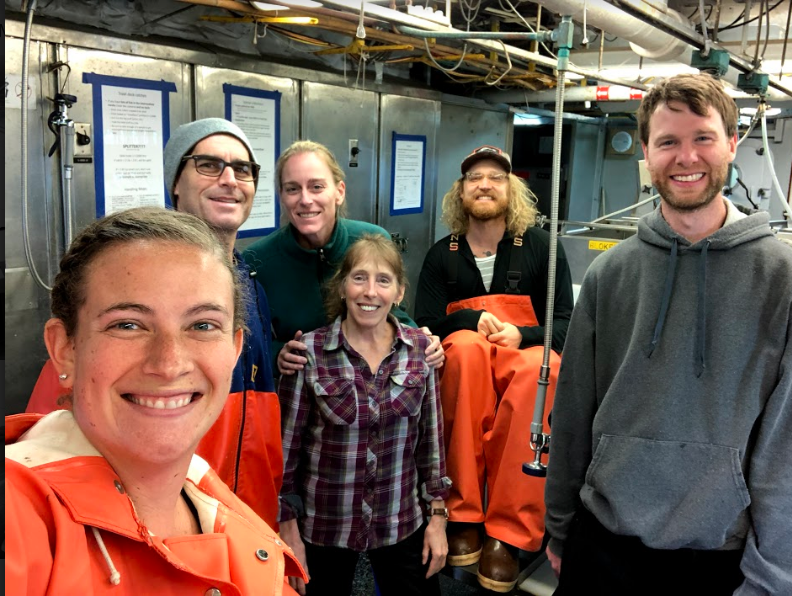 I’m getting to know more about the other people on the ship every day and it’s nice to get into a rhythm and start to really work well together and have a good flow, especially in the fish lab. If we are motivated to finish before meal times, we can process a good haul of Pollock in around 45 minutes. 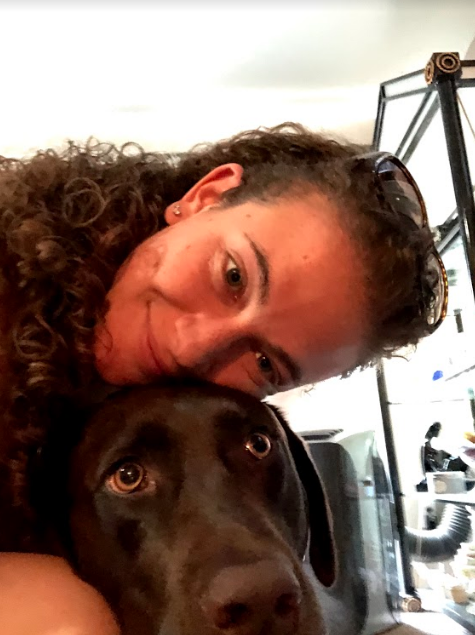 That is much quicker than we started at, and it’s because we have really learned how to capitalize on each other’s strengths and just being willing to do whatever job is needed in the lab, even if it is not our favorite task. I have claimed a workspace in “the cave” (acoustics lab) that is perfectly in the way of the phone when it rings, but it’s usually quiet in there and I can focus on these blogs, reading, or planning for next school year. I’ve also been reading the transcripts to a ton of TED talks when we don’t have access to the internet. In Alaska, during the summer, they experience what is called “the midnight sun”. It is rarely ever dark enough to see the stars during the summer. This happens because of how far north it is! This photo was taken just after midnight on 6/21/18 (summer solstice). 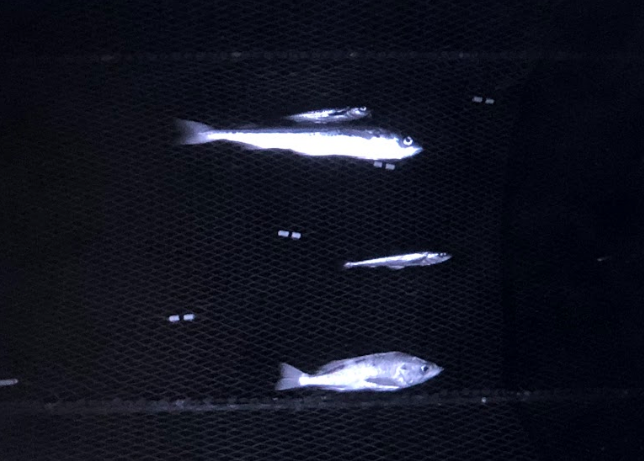 Cam Trawl image of pollock and pacific ocean perch. Can you tell the difference? 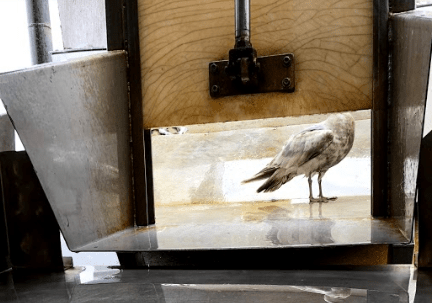 This bird flew into the table where the fish are held before being processed. It was just hoping for a free meal, but ended up getting stuck. After realizing it couldn’t get out on its own, a survey technician helped to get it out and back on its way. The black bars on the sides of the doors hold it shut and are controlled by the black lever on the left of the photo. Talk about a tough door! Alaska Fisheries Science Center. “Yellowfin Sole Research.” NOAA Fisheries, 25 Oct. 2004, http://www.afsc.noaa.gov/species/yellowfin_sole.php. 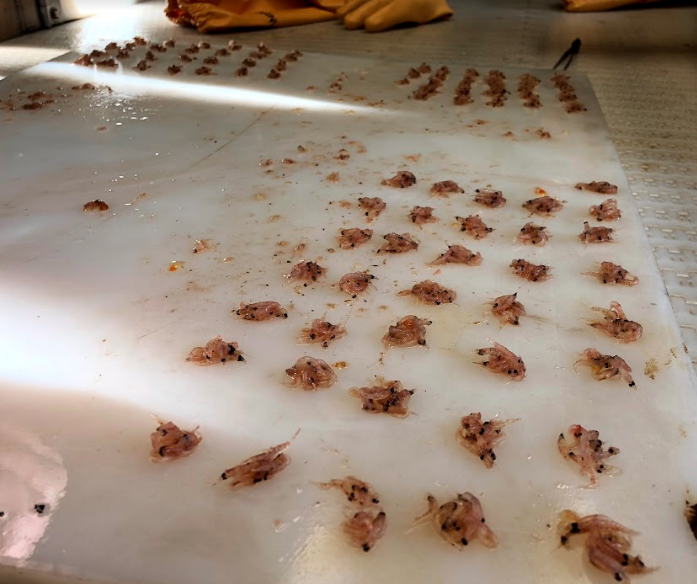 “Crustaceans.” Crustaceans , Marine Education Society of Austrailasia, 2015, http://www.mesa.edu.au/crustaceans/crustaceans07.asp. “Facts.” Facts | Pacific Herring, http://www.pacificherring.org/facts. Jorgensen, Elaina M. Field Guide to Squids and Octopods of the Eastern North Pacific and Bering Sea. Alaska Sea Grant College Program, University of Alaska Fairbanks, 2009. Mecklenburg, Catherine W., et al. Fishes of Alaska. American Fisheries Society, 2002. NOAA. “Chum Salmon (Oncorhynchus Keta).” NOAA Fisheries, 21 Jan. 2015, http://www.nmfs.noaa.gov/pr/species/fish/chum-salmon.html. TenBrink, Todd & W Buckley, Troy. (2013). Life-History Aspects of the Yellow Irish Lord ( Hemilepidotus jordani ) in the Eastern Bering Sea and Aleutian Islands. Northwestern Naturalist. 94. 126-136. 10.1898/12-33.1. There are many different types of samples that are taken on NOAA Ship Oscar Dyson. 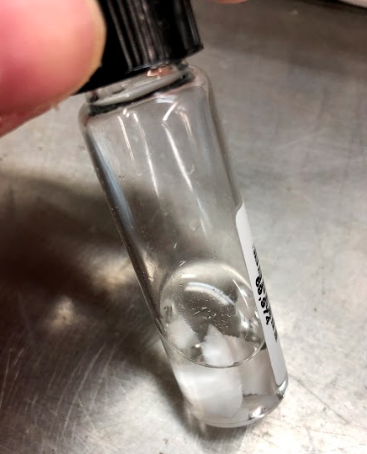 Some of the samples collected on the ship are for the projects of the scientists that are here currently, and other samples are brought back for scientists working on related NOAA projects. The scientists that I am working with are based out of NOAA in Seattle, Washington. 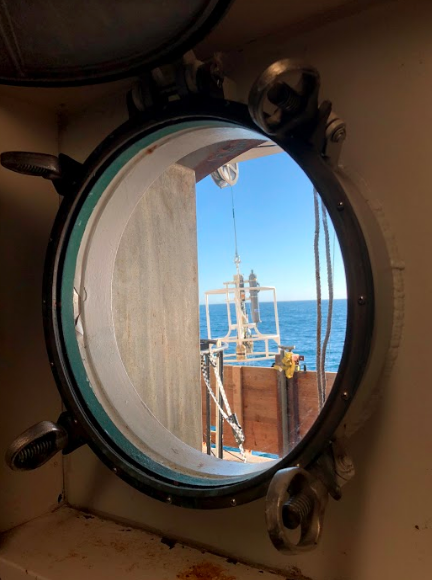 View through a port hole of the Hero Deck on NOAA Ship Oscar Dyson of a scientific instrument called a CTD. The CTD is sent to the bottom of the ocean and back at specific locations. The CTD collects information related to conductivity (salinity), temperature, and depth. The grey bottle attached to the side collects a water sample that will be analyzed later. One of the projects that I have been helping with most frequently is processing the trawl samples once they have been collected. 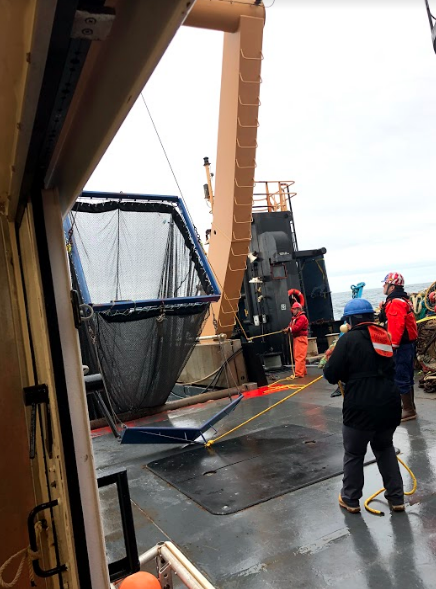 When a trawl sample is collected, a large net is lowered off the stern of the ship that will collect the sample of fish (hopefully mostly pollock) and other living things. The net also functions as a vessel to hold scientific instruments that collect other types of information. 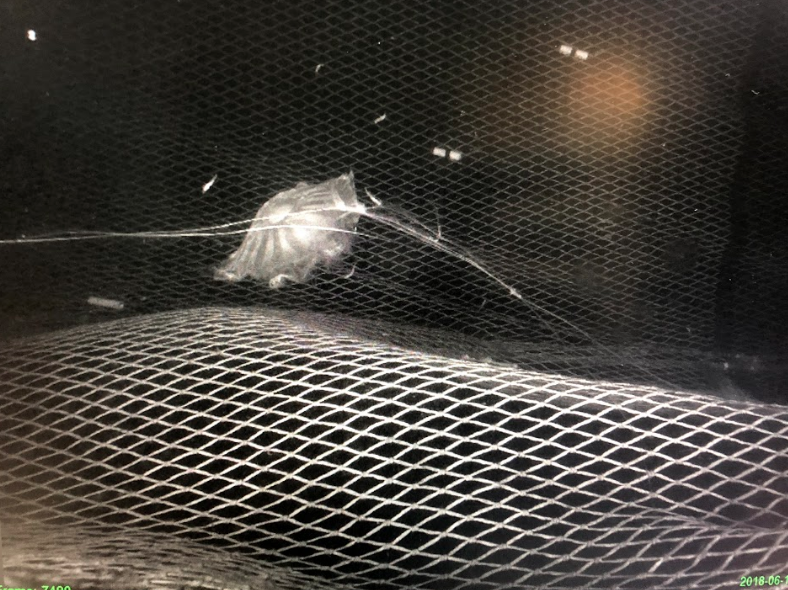 There is a camera (cam trawl) that is attached to the net and this records video that can be watched through a computer to actually see what is being caught in the net. Another useful instrument is the FS70, a sonar device that rides above the opening of the trawl net to ping on the fish going into it. Viewed from a screen on the Bridge in real time, this gives the scientists an idea of exactly how many fish are going into the net, so that they can adjust the depth of the net, or change the length of time for the trawl survey. The goal for each trawl sample is to collect at least 300 pollock. Once the net has been brought in after haulback, the opening at the codend (bottom) of the net is released to allow the sample to be put in a metal tub called the table. The table is capable of holding approximately 1 ton, or 2,000 pounds worth of fish. Sometimes if there is more than can fit on the table, the crew will split the catch in half so that we are only measuring a portion of what was collected. The rest of the fish are stored in another tank on the deck. If we don’t end up with enough pollock on the table, we may need to pick through the other half that was saved on deck until we get enough. 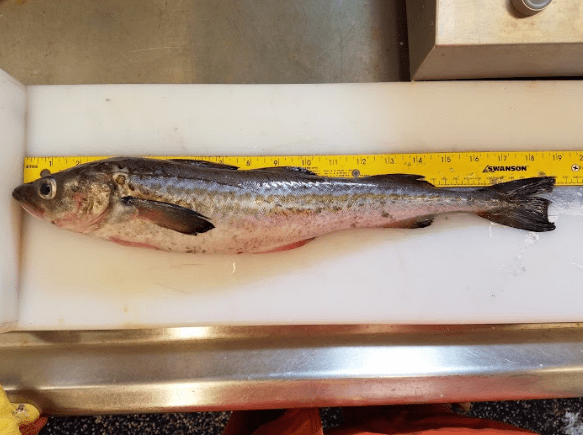 Measuring too few of them may not represent the accurate length compositions of the pollock. On June 11th we collected trawl sample #7. This haul was filled with mainly jellyfish, with pollock and a few herring. The weight of this haul was very close to the amount that the table can hold so it was decided to split the catch. Once we looked at what was put on the table and we realized that it wasn’t going to be enough pollock, Mike and Sarah jumped into the spare tank and pulled out all of the fish (whole haul) so that we would have enough to get as close to that 300 number as possible. When the fish come into the fish lab, we sort out the different species and put them into separate baskets. Each basket is weighed by species and input into a system called CLAMS (Catch Logging for Acoustic Midwater Surveys). After all of the species have been sorted, a percentage of each species will be measured by length. Another percentage of each species will be measured by length and weight. Photo showing Pollock of different ages. From the pollock sample collected, 30 will be randomly picked to have their otoliths removed. The otolith is the ear bone of the fish and it can be used to determine the age of that specific pollock. They have rings, similar to tree rings that can be counted. For information click here. An otolith sample taken from an adult pollock in a glass jar. I have not been shy with anyone onboard about the fact that I would love to see whales if they are around the ship. I feel like this has almost turned into a game at my expense, but I don’t mind. There have been multiple times when there have been “whales” and as soon as I run up the 3 flights of stairs and get to the Bridge, the whales are suddenly gone. I think they are secretly timing me to see how quickly I can run up the stairs! The exercise is good for me anyways. I’ve finished two books already, which has been really nice. I know that I love to read, but never really take the time anymore because it always seems like there is something else that I should be doing instead. There’s a bookshelf here in the lounge, so I’ll find another to read after I finish the last one that I brought. I try to spend some time outside every day, and it is so peaceful. I don’t think I’ll ever get tired of waking up and looking at the ocean. I don’t want to take any bit of this experience for granted. I am so grateful that I have this opportunity and I want to take in as much of it as I can. As I get to know more people on the ship I am starting to get to learn more from everyone about exactly what they do and why they chose to make this their profession. Everyone thinks of scientists, NOAA Corps officers, and engineers as being very serious all of the time, but that couldn’t be further from the truth. Professionalism is incredibly important and is always the focus, but there is also space for fun. Every other day there is a photo competition where a picture is taken somewhere on the ship and you need to find out where it was taken and submit your answer. 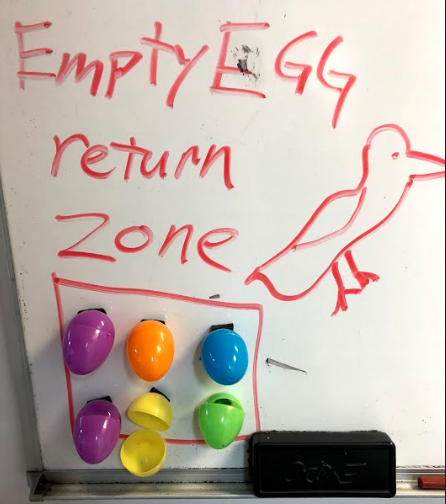 There are also plastic Easter eggs that keep popping up everywhere filled with positive messages, or candy. The “Oscar Dyson Plan of the Day” sometimes has puzzles to figure out on it as well as important information such as location, meal times, sunrise/sunset times and any other important information. 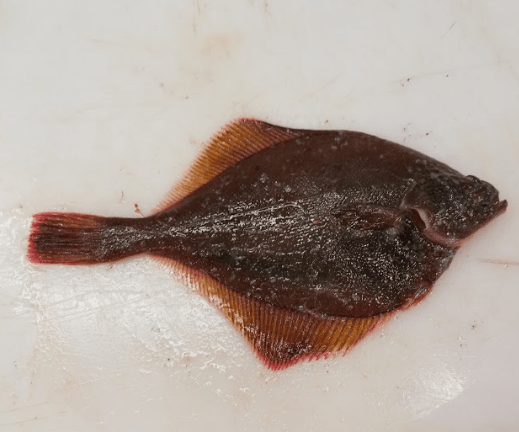 There are 6 different species of flatfish found in the Bering Sea. There are 2 species of Flounder, 3 of Sole, and 1 Plaice. World Oceans Day! June 8th, 2018. What have YOU done to protect the oceans today? 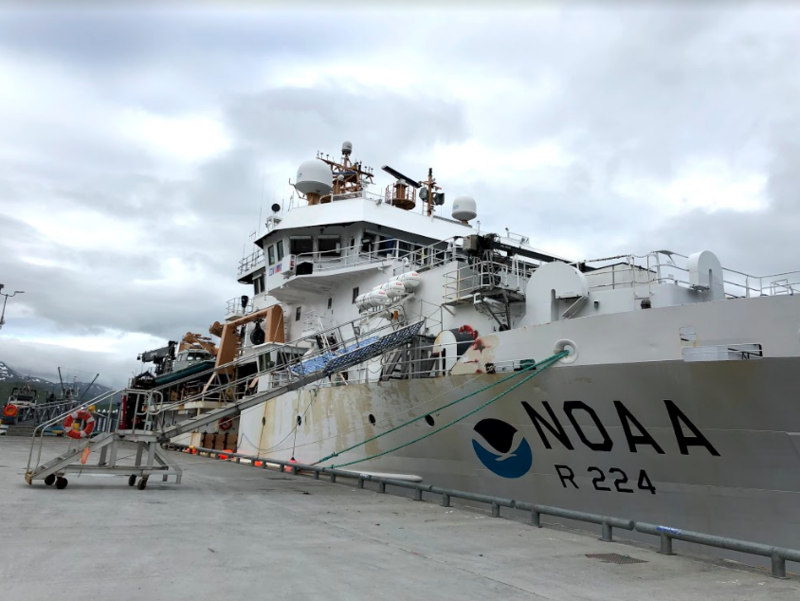 On Wednesday, June 6th 2018, NOAA Ship Oscar Dyson left port from Dutch Harbor Alaska at 08:00 to go and fuel up for the upcoming voyage. Fueling the ship takes hours and during that time, NOAA Ship Oscar Dyson took on over 50,000 gallons of fuel. After the ship was fueled, it searched for a spot in Captain’s Bay to calibrate the acoustic equipment. 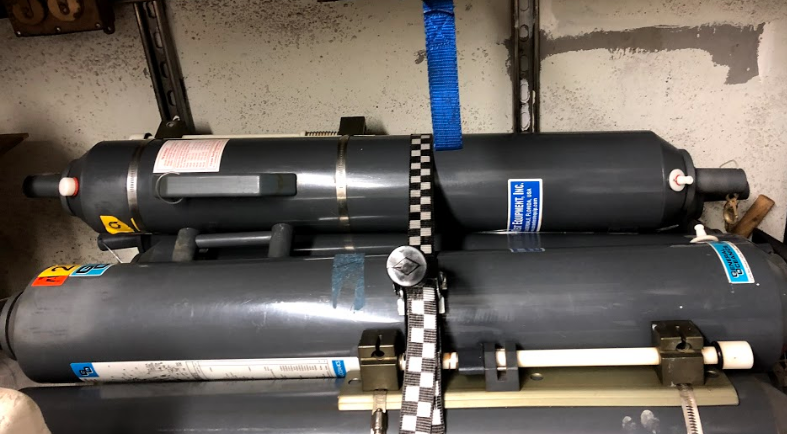 In order to calibrate the equipment, a metal ball made of tungsten carbide was suspended beneath the boat under the center board. The ball has known acoustic return values based on density and purity of the metal. It is attached at three points to the boat so that it can be moved under the center board to calibrate each transducer.. The location of the ball is adjusted under each transducer one at a time to the center of each beam. Adjustments to the equipment will be made if the return from the ball at each transducer is not as it is expected to be. The scientists had to change the depth of the ball in the water in order to avoid the fish to get an accurate reading. The calibration can be different depending on the temperature of the water and the salinity (saltiness) of the ocean. A second calibration will be taken at the end of the research cruise and the average will be used in the necessary calculations. Once calibration was complete and the equipment was retrieved, the ship started heading to the beginning location of the first transect line. The journey from our calibration point to the start of the first transect line took approximately 23 hours, traveling at 12-13 knots. The ship reached the northern end of the first transect line at approximately 21:00 (9 pm) on June 7th. The first trawl sample was taken shortly after at sunset, which was approximately 23:30 (11:30 pm). This is not an ideal time to collect a trawl sample though since the fish move and behave differently at night. 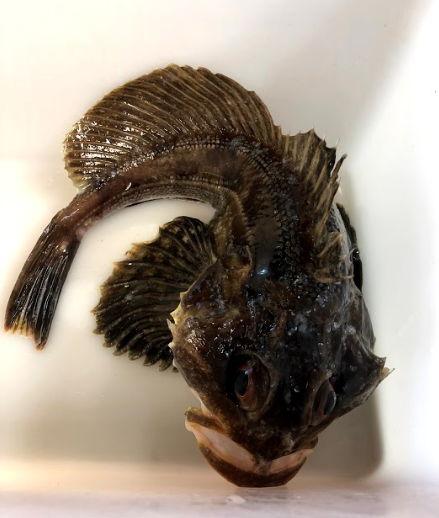 The first trawl sample of the survey that I participated in was on 6/8/18 at approximately 15:30. Operations on the ship run 24 hours a day, so some members of each team onboard need to be awake and working at all times. Shifts for the science team are 12 hours long and the day shift runs from 04:00 (4 am) to 16:00 (4 pm) and the night shift is from 16:00 (4 pm) to 04:00 (4 am). 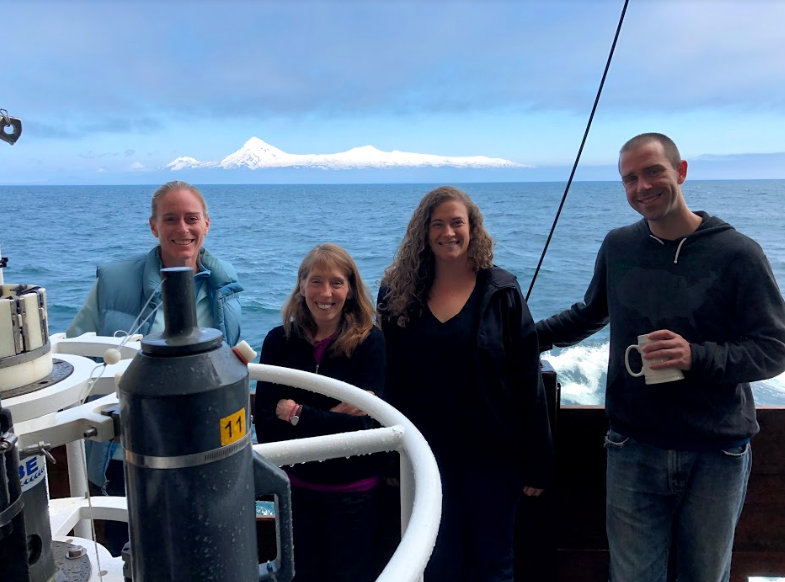 I am assigned to the day shift along with Chief Scientist Denise McKelvey and Fisheries Biologists Sarah Stienessen, Mike Levine, and Scott Furnish. On the night shift for the science team are Nate Lauffenburger, Darin Jones and Matthew Phillips. 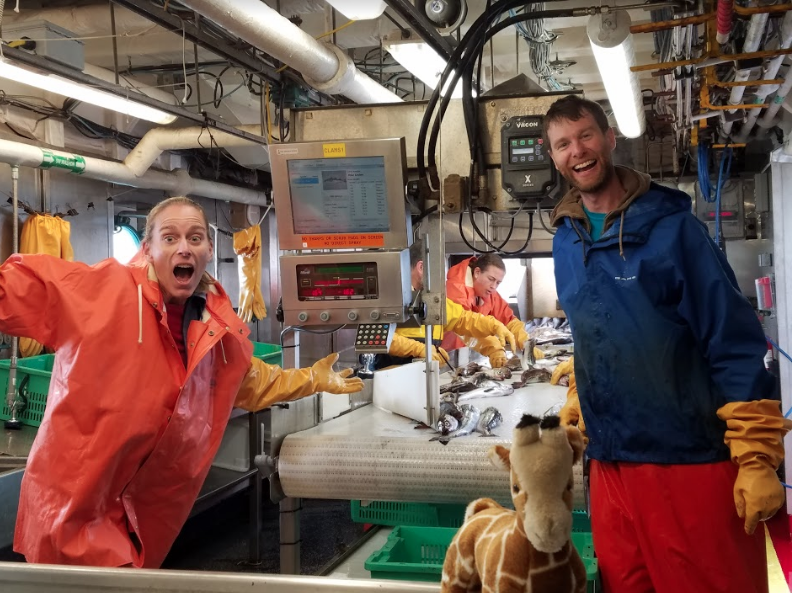 In order to collect a trawl sample, members of basically every department on the ship are involved. The NOAA Corps officers are on the Bridge driving the ship, charting the course that the ship will be traveling on as it collects it’s samples, as well as keeping track of the net, and all of the other duties that they regularly hold. The stewards keep us all fed and happy. 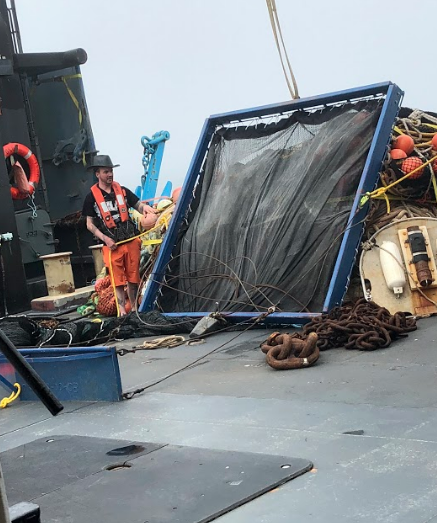 The deck crew are in charge of making sure that all of the nets are hooked up properly and are put into the water correctly as well as controlling the winches that release the nets. The engineers make sure that all equipment is functioning properly. The survey technicians ensure that all of the scientific instruments used for making any type of measurements are attached to the net at different points, mainly on the kite. The “kite” is a section of the net primarily used for holding scientific instruments. Some of the scientists are preparing the fish lab and getting dressed in waterproof gear, while the Chief Scientist is on the Bridge with the officers giving direction about where and when to start and stop trawling and exactly how deep the nets should be set. Adjustments to the net are regularly made during the sample collection. Waterproof gear hanging in the “ready room”. 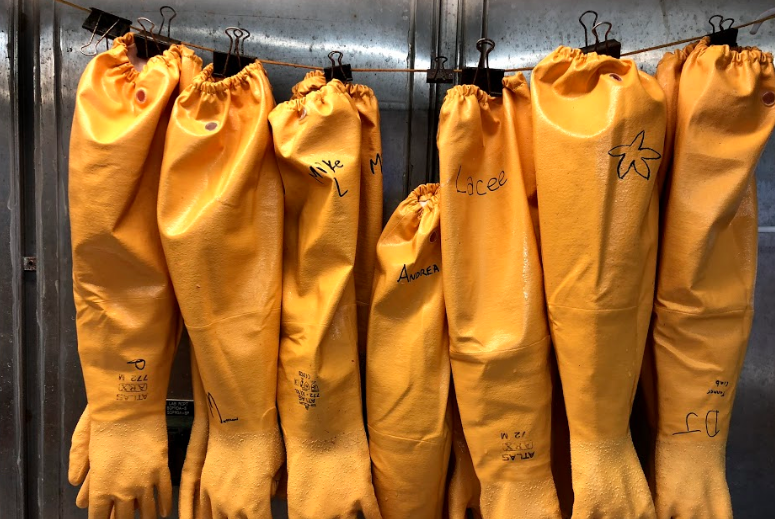 Gloves hanging to dry in the fish lab. The locations for when trawl samples will be collected is not pre-determined before the start of the research cruise. The sites for samples are determined in real time by looking at the data collected from the acoustic pings being sent out by the transducers. There are 5 different frequencies( measured in kilohertz) sent out by the ship’s transducers: 18 kHz, 38kHz, 70 kHz, 120 kHz, and 200 kHz. The acoustic frequency that may best indicate the presence of pollock is 38 kHz. The chief scientist decides when she wants to “go fishing” based off of looking at the results coming back as echoes to the ship. This is what the acoustic data points look like as the ship is moving on the water. All 5 different frequencies are depicted in this image. The top left is 18kHz, bottom left is 38kHz (best for pollock), top right is 70kHz, middle right is 120kHz and the bottom right is 200kHz. Each dot represents an echo received by the ship’s transducers after the sound hits something in the water. The solid red band near the top of each window is the depth of the sonar transducer sending the acoustic pings, while the heavier red band at the bottom of each window is the sea floor. On this leg of the research cruise thus far, 3 trawl samples have been collected from the transect lines. I will include more detailed information and photos of the fish processing protocol in my next blog. In the next three pictures, there are temperature and depth profiles of our sample collection. The depth (in meters) is shown by the shape of the line as it rises and falls, and the color shows the temperature (in degrees Celsius) that goes with the scale on the right of each figure. More specific details are underneath each image. 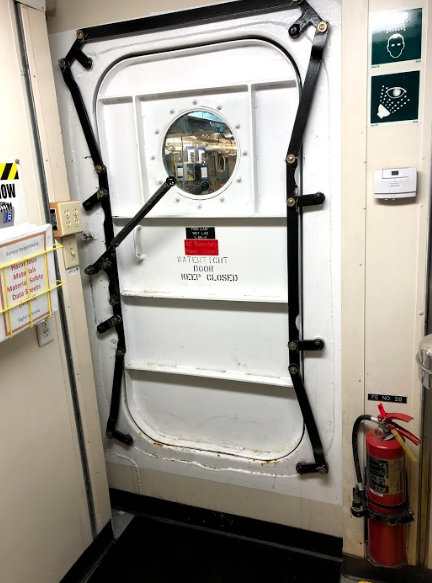 Now that the ship is in the middle of the Bering Sea and is moving, I have learned an important lesson: You can’t trust the floor. I know that sounds weird, but usually you know exactly where the floor is going to be when you are walking, but when the ship is moving in the water, the floor may be higher or lower than expected, causing a lot of wobbling. This is especially challenging for someone who is as naturally clumsy as I am. There are times when I feel like a toddler learning to walk again, but I am getting more and more used to it already. At night it feels like being gently rocked to sleep. I’m learning my way around the ship and I am starting to not walk right past the doors that I need to go into a few times before I remember that it’s the right place. I am also getting more familiar with the people onboard as well as the schedule. Since my shift that I am working on is from 04:00 (4 am) to 16:00 (4 pm), it took a few days for me to adjust and everyone was very patient with me. Coffee definitely helps! The meal times are as follows: Breakfast 07:00, Lunch 11:00, Dinner 17:00 and there are always some snacks available in the Galley. 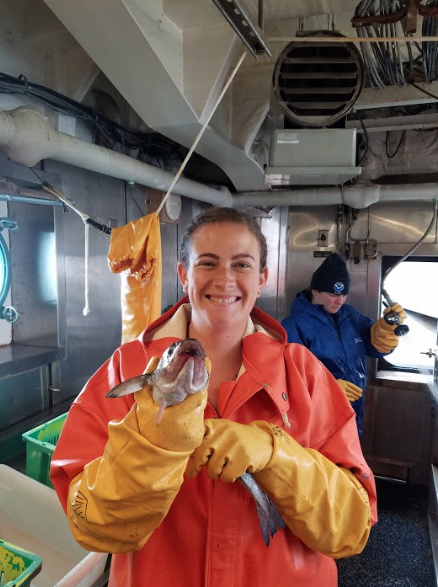 Photo of TAS Lacee Sherman aboard NOAA Ship Oscar Dyson in the Eastern Bering Sea. In my downtime on the ship, I have found a new favorite location; the flying bridge! The flying bridge is located above the Bridge (where the Ship is controlled). There is a chair up there that makes the perfect spot on a nice day to sit and read for a little while. It is windy and cold, but worth it! The view from up there is pretty amazing! Image taken off of the Alaskan Peninsula taken from the Flying Bridge on 6/9/18 in the morning. Image taken off of the Alaskan Peninsula taken from the Flying Bridge on 6/9/18 in the afternoon from a closer location. The bow of NOAA Ship Oscar Dyson taken from the Flying Bridge. The Stern of NOAA Ship Oscar Dyson taken from the Flying Bridge. The NOAA Commissioned Officer Corps is one of the 7 uniformed services in the United States. The other 6 include: Army, Marine Corps, Navy, Airforce, Coast Guard, and the Public Health Service Commissioned Corps. Currently 9 of the people aboard the NOAA Ship Oscar Dyson are women. If there are 31 total people on the ship, what percentage of them are women?